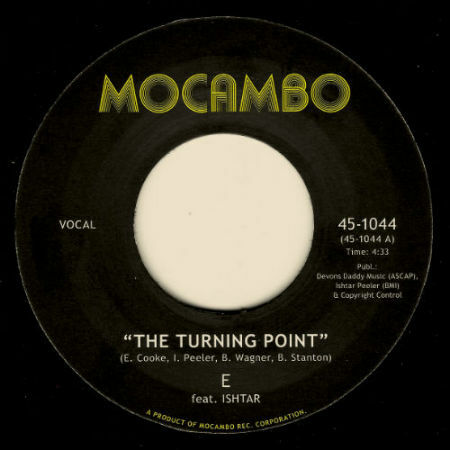 Mocambo Records proudly presents the first 45 with the unmistakable E (aka Eric ‘E da Boss’ Cooke, and one half of soul duo Myron & E out on Timmion Records and Stones Throw). E is a multifaceted artist who started out as a DJ and producer and eventually developed into the singer/songwriter we know today. As part of Myron & E he has toured the world but he also has a successful solo career with various releases and collaborations under his belt. This new single, titled “The Turning Point” is a dramatic piece of soul with dope drums and a cinematic orchestration, which sees E and his female duet partner Ishtar ‘breaking up’, while the flipside features the instrumental version. This is a vinyl only release, available in limited quantities and as a first taste of the collaboration between E and Mocambo Records. You can buy it HERE.